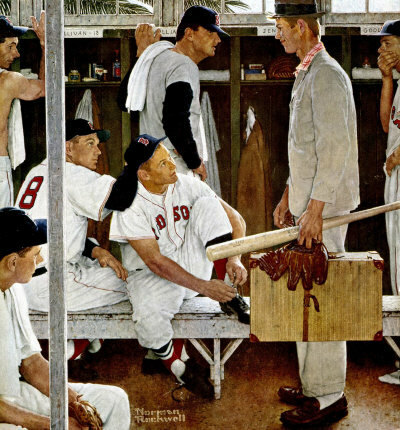 Red Sox Locker Room, a Norman Rockwell painting , appeared on the cover of The Saturday Evening Post published March 2, 1957. This is another timeless favorite of Rockwell collectors, a classic for all the ages. An alternate title is The Rookie. This painting was Rockwell's 294th overall out of 322 total paintings that were published on the cover of the Saturday Evening Post. Rockwell's career with the Post spanned 47 years, from his first cover illustration, Boy With Baby Carriage in 1916 to his last, Portrait of John F. Kennedy, in 1963. This was also the first cover for The Post in 1957. In 1957, there were five Norman Rockwell Saturday Evening Post covers published. One study also appear in the Norman Rockwell Catalogue on page 212. A charcoal on joined paper a study , part of the collection of movie producer George Lucas, appeared in the Smithsonian exhibit, Telling Stories: Norman Rockwell fron the Collections of George Lucas and Steven Spielberg . Norman Rockwell shows us a familiar scene from locker rooms in all sports. A new guy or gal arrives. The veteran players do not know if the new guy will cut it and last on the team. The new guy doesn't always know what to expect from the veteran players. We know the identities of the veteran players. Pitcher Frank Sullivan ties his shoes. Jersey No 18 Jackie Jensen, the Right Fielder, sits with Sullivan on the bench. Catcher Sammy White sits at the bottom left of the painting. Second baseman Billy Goodman on the right margin is covering his smile. And, of course in the center of the painting is the "Splendid Splinter" himself, Hall of Famer Ted Williams. Williams is the only one who was not there in person to model and pose. Rockwell painted Williams' likeness from his collection of trading cards. The focus of all the other characters is, of course, the rookie, who was actually Sherman Safford, a local high school star athlete from Pittsfield, Massachusetts. He was asked by Rockwell to fill this part. Red Sox Locker Room was only one of 322 Norman Rockwell Saturday Evening Post covers; Here is the list of Norman Rockwell Saturday Evening Post cover illustrations. The model for the player in the left margin is not known, but he appears again in After The Prom, the next Norman Rockwell magazine cover published. Do You Have A Great Story, Opinion Or Contribution About Red Sox Locker Room?